Self Stick Steel House Numbers - - individual 4.75" self-stick address numbers. Sturdy plated-steel construction (almost 1/2" thick). Individual numbers can be applied to a mailbox, mailbox post, interior or exterior door, garage door . . . and to almost any flat surface that needs a number. Numbers: 0, 1, 2, 3, 4, 5, 6, 7, 8, 9. 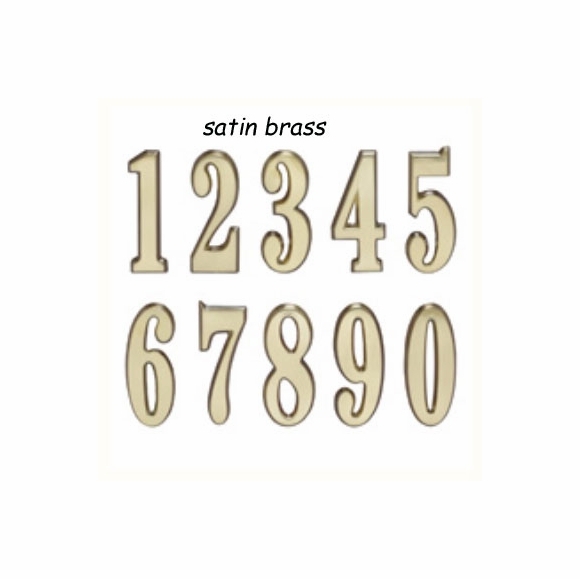 Colors: satin brass or brushed nickel. Comfort House P2088. Special order. Individual 4.75" plated-steel self-stick numbers.